Imagine walking outside of your home knowing that you can’t get to your neighboring town, or even the nearest hospital, without hopping on a plane. That scenario is a reality for a great number of native Alaskans, especially those living in the remote regions of the state. But for many, high speed internet is about to make their lives much easier. With the recent construction completion of seven towers in the Arctic Circle, GCI, Alaska’s largest internet service provider, is about to bring a whole new level of connectivity to a part of rural Alaska. Construction of the towers is one piece of a larger project called TERRA (Terrestrial for Every Rural Region in Alaska), which GCI first started in 2009. The project’s end goal is to give every Alaskan the same advantages that those in the “lower 48 states” take for granted. TERRA currently serves 49,000 Alaskans across 72 communities, and the project is still expanding. In fact, if you stretched out the TERRA project, it would reach from Washington, D.C. to Las Vegas — about a 2,400-mile drive. There are no roads connecting many rural Alaskan communities to one another, making this effort all the more challenging. Even villages that are 10 miles apart lack roads in between, making them essentially islands. So what does it take to connect these “islands” to the rest of the world? The logistics involved in getting the equipment to the right places to power these communities is a feat in and of itself. GCI TERRA project manager Mark Carlson and program manager Rebecca Markley explained that there are currently around 24 mountaintop sites used for these villages for tower construction. Everything has to be flown in via heavy-lift helicopters. 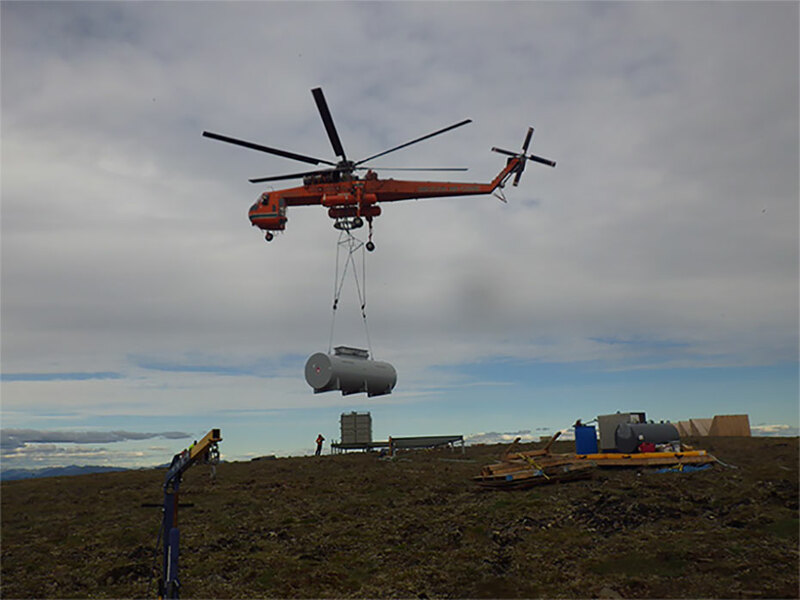 It takes a lot just to get those helicopters and the heavy equipment up to the mountain sites. Since the helicopters are usually used for fighting forest fires, GCI has to book them out a year and a half in advance, and only for a short time period. “We only have a matter of days to get everything out to the mountaintops,” said Carlson. And because the weather in Alaska is often unbearable for a large part of the year, the helicopters can only fly in during the summer time. “July is good, it gives us time to mobilize the shelters out there when the ice clears from the landing areas,” said Markley. Limited daylight is another logistical challenge that crews face. Technicians have to go into remote regions with a week’s worth of survival gear and food just in case they or the helicopter get stuck due to fading daylight or weather impediments. The equipment that gets flown in can weigh upwards of 17,000 pounds — that’s the limit that the helicopters will hold. “So the contractors have to build the shelters knowing the equipment flown in is all under 17,000 pounds, so we can get them to the mountaintops,” said Markley. The sites also need power to keep them running year-round. “Refueling is a big part of this project,” said Carlson. “We build the sites with the fuel tank so they can run untouched for a year.” A team of 40 will go out to refuel every spring to give the communities 18 months’ worth of fuel per site, but timing is critical. The fuel gets barged in from Anchorage months ahead of time since these small communities can’t supply the enormous amount required. Migratory restrictions also pose obstacles for the refueling teams. During caribou season, for example, the crews are prohibited from accessing certain sites for a better part of a month. In the end though, all of the careful planning and logistics is worth it when Alaskans receive the next level of connectivity they need to connect with the rest of the world. While previous satellite services gave them connectivity, the latency was a real killer, explained Carlson. Right now, many only have voice cellular service, but with high speed internet, 3G service is now possible. “The biggest drivers economically are the schools and the clinics,” said Carlson. In a village of only 50 kids, the teachers can give them much more specialized learning through the distance learning that comes with advanced technology and the internet, like video conferencing. As we wrote about earlier this fall, remote Alaskan village schools benefit greatly from the video conferencing that exposes students to a myriad of experts, teachers, and courses that they couldn’t access within their village school alone. And when it comes to healthcare, telehealth can cut down huge costs and stress for the many Alaskans who would have to be taken by helicopter to the nearest hospital just to be diagnosed and treated for an ear infection. Telehealth, on the other hand, allows for immediate medical and psychiatric evaluations that can happen from Anchorage out to the villages, and for medical training for villagers over the internet — thus reducing the number of trips that people from sub-regional villages have to take to get proper healthcare. On the consumer side, Markley relayed that high speed internet has brought with it a surge in online shopping. Native Alaskans have access to items and materials they never imagined they’d be able to shop for before. Small businesses can reach new customers online that they couldn’t before, paving the way for budding entrepreneurs. The native artists are also able to sell their work and products over the internet, whereas before, they were only able to sell when people came to visit their village. The next year or two is bound to be an exciting time for the new communities receiving this whole new level of internet service. The sites are physically up, the shelters are built, and what remains to be done is upgrading the backbone connectivity as GCI looks to do a series of network tests for these sites in 2017 — which, as we know, is dependent on many factors including weather and land restrictions. But GCI powers on. “We are constantly looking for new villages to deliver to,” said Markley. “And we’re always looking for new technology that will make things faster and better. It’s an ongoing process,” said Heather Handyside, director of corporate communications at GCI. Like their counterparts in the rest of the country, Alaskans are always demanding more and more bandwidth — whether it’s to livestream an event, video conference, or to connect with family and friends. “We truly are at the edge of what wireless can do today, but we are out to do more,” said Carlson.